They said the same thing on the Ford-Ranger Forum. How do I do that! I apologize, I am not computer savvy! Please tell me how to add a picture. I would very much appreciate it. There is a picture next to my name. There is one next to yours, so what gives. I feel like a damn child! And I just turned fifty, may 31. Please explain, They did say the same damn thing on the other forum. I am going back there and say the same damn thing. I don`t want to see that again. PICTURES WOULD HELP. Last edited by Walker65; 06-13-2015 at 02:41 PM. Once you upload them to there, you can click to share.. and copy and paste the [IMG] code into this thread. Other than that, calm down, haha. You're being pretty vague, so naturally people are going to ask for pictures because "a picture is worth a thousand words". Saying they are crooked means nothing to me.. crooked how? Leaning foward, leaning back, leaning inward, leaning outward.. so yes.. Pictures would help. All I can do is ask my sister for help on the pictures. That sounds like a lot of work to me. But she is real fast on these computers. for all I know it might take her one second or less. Me, I don`t know if is even possible. I want know till she shows me! 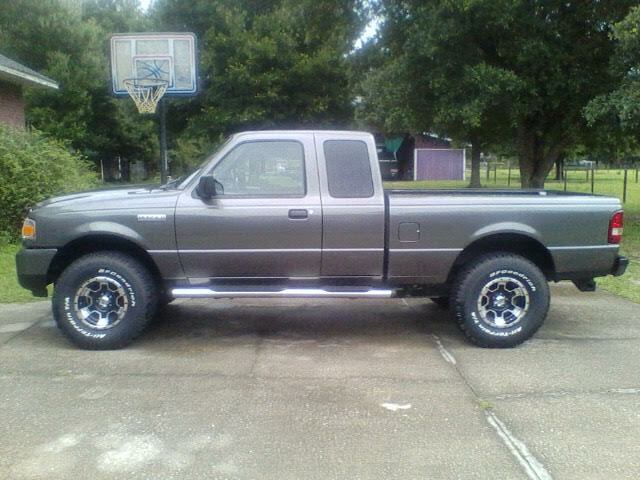 Now about the step bars. when you look at the truck from the side, of course, they look like they are angled upward in front (upward angel). Like they slope down toward the back. I know my sister could have done this much faster with a picture, But she is in bed. Now its not the brackets. Its the truck that's what J.C. customs told me. They said that's why they don`t make that many step bars for the ranger. And I paid $508.00 for them. My dad keeps telling me to take it to a welding shop. No matter what anyone says! But both places told me if I do that, The step bars will then angle downward. Now do you understand what I am saying without pictures. And in less than a thousand words. haha. This is the passenger side. Yes that helps a little. Is there any way that the rear brackets can be adjusted? For example, loosen up the bolts that mount the step bars to the body, push up on back of the step bars and then retighten the bolts? Maybe they're designed that way because the rangers have a natural forward lean.. so in order to combat that, they designed them to lean back so when installed they sort of sit level? I would just look and see if there is any wiggle room to adjust the bolts.. either front down a little, or rear up a little. Did you use washers anywhere? I don`t know. I did not put them on. you are right about what you are saying about the truck. I would prefer them to come down some in the front. 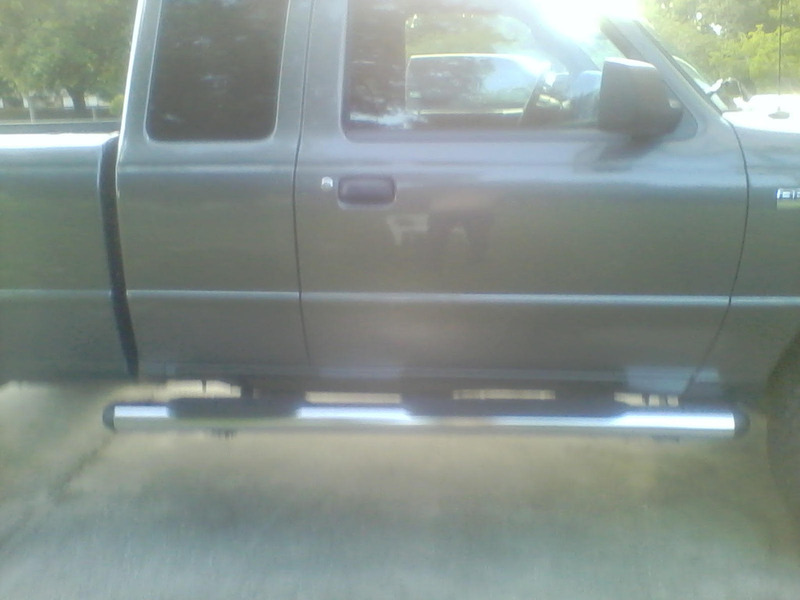 All I can say is that my factory Ford step bars sit perfectly level on my truck. So if those fit right, there's no reason why these don't fit level. The fact that they told you "It's because it's a Ranger" is absolutely ridiculous. If these step bars were truly made for a Ranger, then there's no reason why they don't fit. If these step bars weren't made for a Ranger, then that's why they don't fit. Do these brackets use the factory location on the body?